Business School of Central South University, Changsha, China. Received September 29th, 2009; revised September 15th, 2010; accepted October 25th, 2010.
auditors is also the operation of this theory. It’s urgent to find an effective way to deter collusion. about the agent, he may frame and blackmail the agent. lyzes the problem of side-contracts. second, a fourth to monitor the third, and so on. 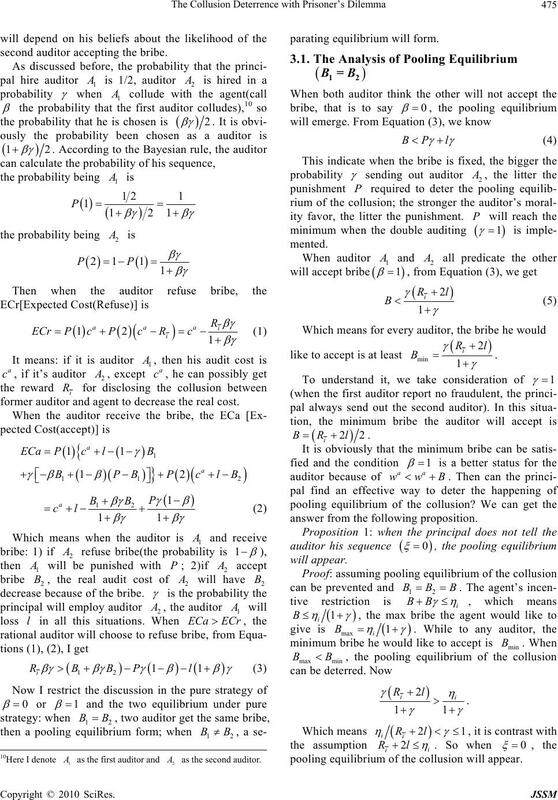 the Bayesian Perfect Nash criteria. creates the source of his private in for mation. possibility of adding a second auditor. 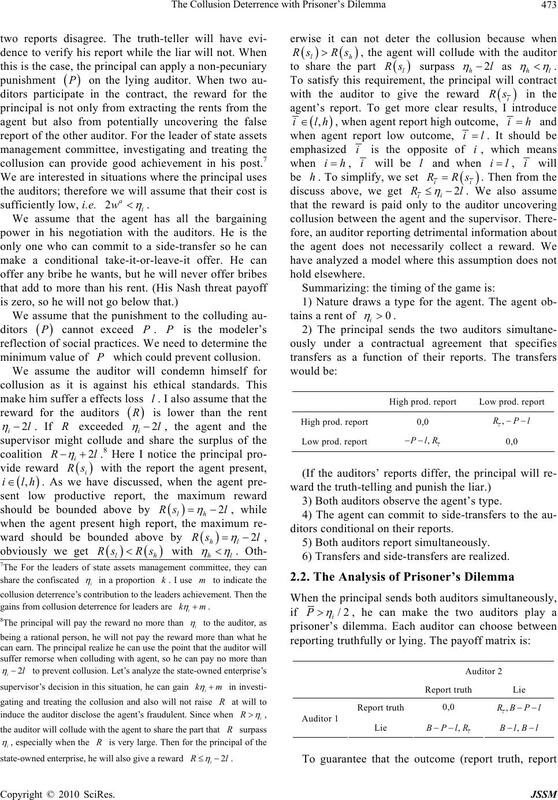 tor’s prisoner’s dilemma to deter the collusion [7,8]. financial statements, which helped inflate share values. ment in th is paper. tion, and, therefore, improve expected welfare . preventing collusion in the following discuss. 1If they both know their position, collusion cannot be prevented. tion. Finally, Section 5 gathers our conclusions. payoff in any state of the world. 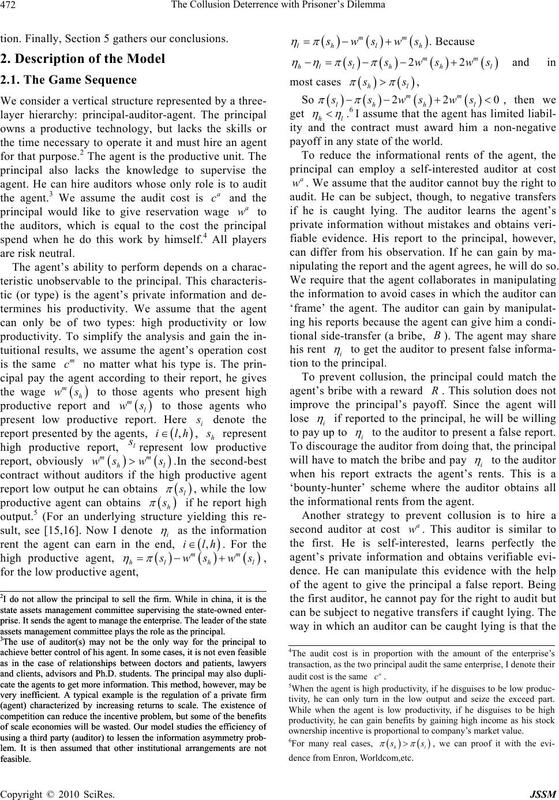 nipulating the report and the agent agrees, he will do so. tion to th e princ ipal. to the auditor to present a false report. the informational rents from the agent. assets management committee plays the role as the principal. audit cost is the same . tivity, he canonly turn in the low output and seize the exceed part. ownership incentive is proportional to company ’s market value. mini mum v alu e of which could prevent collusion. 3) Both auditors observe the agent’s type. ditors conditional on their reports. 5) Both auditors report simultaneously. 6) Transfers and side-transfers are realized. gains from collusion deterrence for leaders are . who accepts a bribe be slightly higher than the bribe. probability less than one when is allowed to grow. (2) The agent offers a bribe 1 to the first auditor. is positive. The agent gets no rent. End of the game. , which is common knowledge. from the principal by denouncing the first auditor. second auditor accepting the bribe. former auditor and agent to decrease the real cost. answer from the following proposition. pooling equilibrium of the collusion will appear. 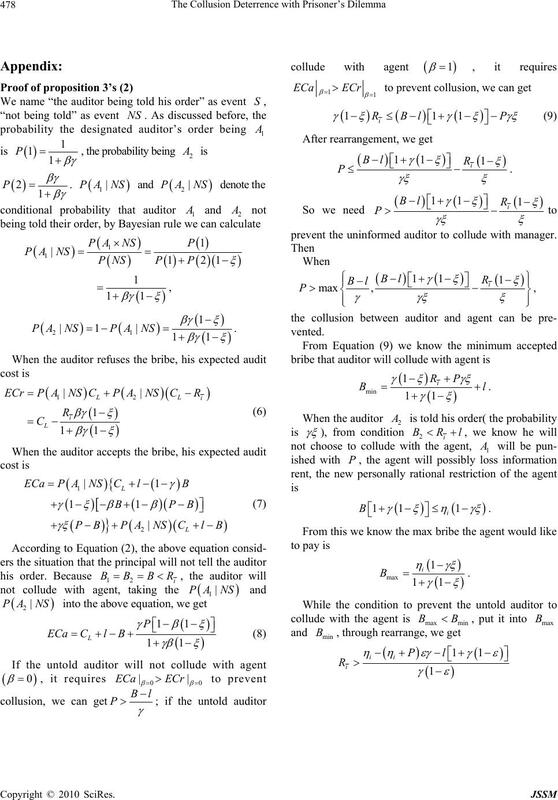 arate equilibrium of the collusion will not form. be punished because they will never be caught actually. collusion by introducing the asymmetric information? 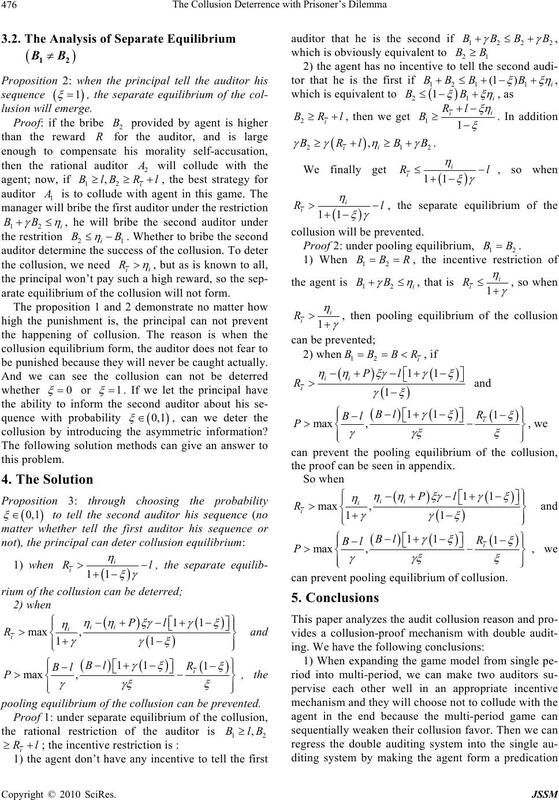 pooling equilibrium of the collusion can be prevented. Proof 2: under pooling equilibrium, . the proof can be seen in appendix. can prevent pooling equilibrium of collusion. the auditing cost of the principal. crease the auditor’s inclination to provide fake reports. 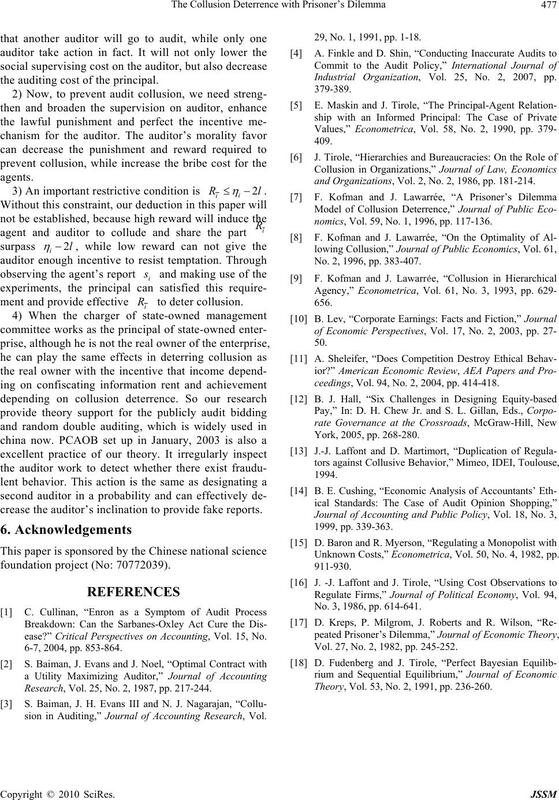 ease?” Critical Perspectives on Accounting, Vol. 15, No. Research, Vol. 25, No. 2, 1987, pp. 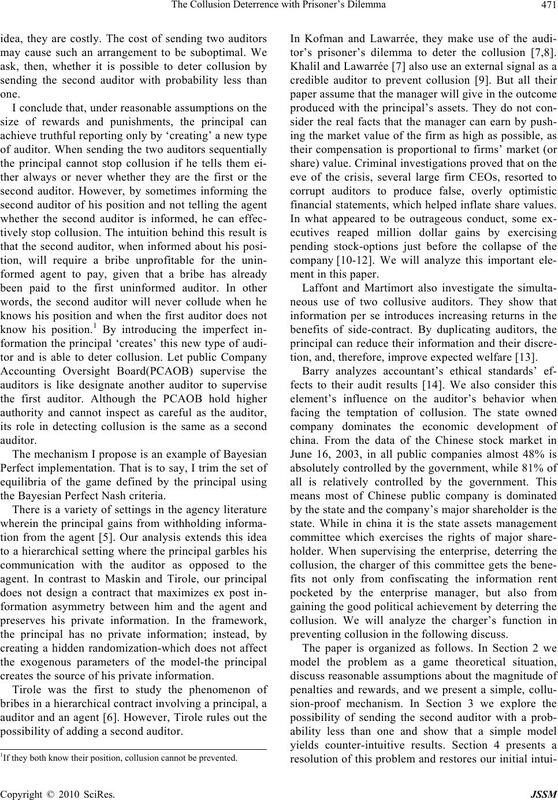 217-244.
sion in Auditing,” Journal of Accounting Research, Vol. 29, No. 1, 1991, pp. 1-18. Industrial Organization, Vol. 25, No. 2, 2007, pp. and Organizations, Vol. 2, No. 2, 1986, pp. 181-214.
nomics, Vol. 59, No. 1, 1996, pp. 117-136. No. 2, 1996, pp. 383-407.
ceedings, Vol. 94, No. 2, 2004, pp. 414-418. 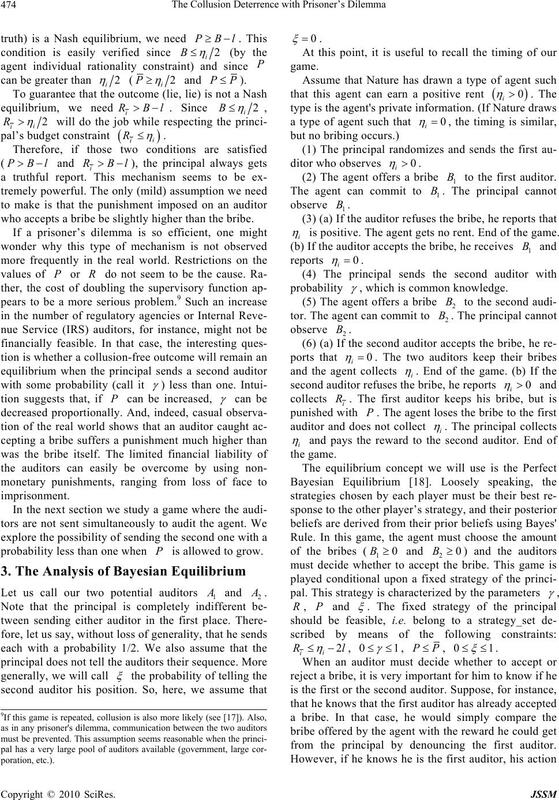 Unknown Costs,” Econometrica, Vol. 50, No. 4, 1982, pp. No. 3, 1986, pp. 614-641. Vol. 27, No. 2, 1982, pp. 245-252. Theory, Vol. 53, No. 2, 1991, pp. 236-260.
prevent the uninformed auditor to collude with manager.